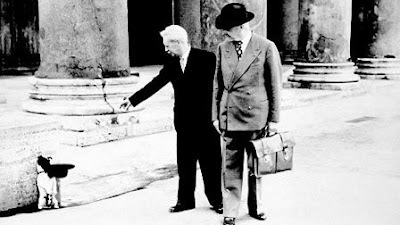 Umberto D. is about suicide. Maybe you disagree. Or if you agree, perhaps you’d qualify it: pointing out that Umberto D. is about a great many other things too. Poverty, for example; the dismissal of the elderly before their time; the callowness of modern life; the value of a loyal dog. I admit my view is minimalist. Umberto D., to me, is about a man on a path to personal extinguishment, and everything in the film either propels him toward that end or slows him down. It is their purpose. Even the director’s an accomplice. Umberto D., like Vittorio De Sico’s earlier film, Bicycle Thieves (1948), centres on a once-useful man who is marginalized because he cannot earn his keep. Both films present society as unreasonably hostile: through one-on-one interactions, but also through brutish crowds and indifferent labour laws that let decent men starve. Their protagonists are both desperate to survive, not only for their own sakes, but for the sake of those they support. The difference, for me, was the strength of the hold each man’s dependents had upon him. In Bicycle Thieves, there is a little son, with a voice, who can use it to plead and reason; in Umberto D., there is only a dog, ‘Flike’, with no voice. Umberto loves that dog, but that dog’s best argument for keeping Umberto around hasn’t evolved since the day they met. Umberto Domenico Ferrari (Carlo Battisti) is an elderly bachelor living alone in a Roman flat. He is a pensioner who can barely afford to eat, yet you wouldn’t know it if you met him: he’s also well-groomed with a silver moustache, a proper-fitting three-piece suit, and an energetic pet. Only if you followed him home would you realize his situation. There you’d see the tiny space he lives in and meet his tyrannical landlady Antonia (Lina Gennari), who’d rather evict him than take his money. Umberto’s only friend, besides Flike, is Maria (Maria Pia Casilio), the building’s teenage maid. Maria didn’t seem very bright, to me. She likes the old man, but she has her own problems. De Sica suggests a whole city turning on, and turning out, Umberto. Driven from the public square along with hundreds of other old pensioner-protesters, he soon discovers he’s the only one (of those he’s speaking with) who is actually destitute. Later, he’s told not to return to a café after feeding Flike from his plate. And later still he’s released from a hospital after only a week, which is a double joke, since he faked sick to get there in the first place. Nobody wants, or needs, Umberto for anything. Except the dog. It becomes clear that caring for Flike is the only task Umberto simply has to do in his entire life. Nothing else is necessary, leading him to believe, naturally, that life itself is not necessary. I’m reminded of stories my parents told about people their age who ‘retired to their armchairs’ and soon seemed years older. One must have something to live for. But even the film itself; even its tone and camera angles make life impossible for Umberto. Antonia pushes things toward farce when she rents out his apartment to couples—by the hour—then knocks a hole in one of his walls. Umberto’s door seems to have no lock, as people open it at will, even at night, and the walls are so thin that Antonia’s opera-singing friends invade his space with every note. Whatever identity he has left is unfixed; it exists in no defined space with true boundaries, physical or otherwise. Meanwhile, De Sica again and again films hallways, alleys and streetscapes as though they’re huge—as though crossing even short distances is, for Umberto, monumental. How can he get anywhere? How can he go on, when even space and time seem to thwart him? Umberto struck me as somebody who’d normally be the running gag in a true comedy or the comic relief in something dramatic—not the star. That’s important. Consider this scene, perhaps his moment of truth: Umberto, reduced to begging, extends his hand on the sidewalk—only to shake it suddenly when someone approaches with change, as though he were checking for rain the whole time. Afterward, he has the dog hold an upturned hat in its jaws, while he hides nearby. This scene, which is thick with pathos, has all the trappings of slapstick, too; with a few tweaks, that’s what it would be. Now it’s commonly said that we laugh at, not with, comedic characters. But what if one died? The fact of mortality often brings us together. 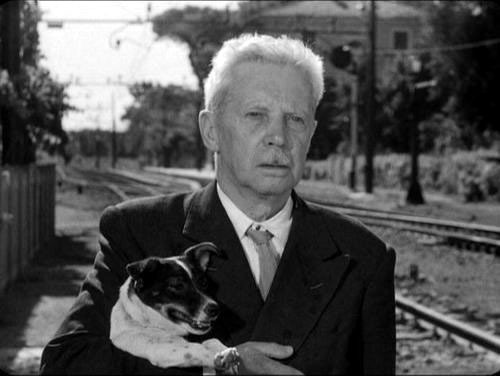 In Umberto D., the doom is all-too impending to let you forget what the old man is going through; you cannot suspend your sympathy for him, even if he is a bit silly. And Flike remains the ultimate magnet for sentiment; a loyal, unjudging friend to the end, like all good dogs. Without Flike in the world, Umberto might be better off dead. The only problem is that Flike needs to be fed. There’s more than one way to deal with that, once Umberto accepts it. 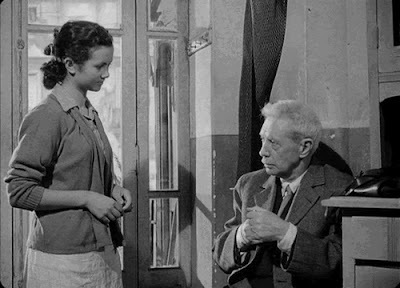 Umberto D. screens at 6:30pm on August 1st, 2011, at Toronto’s TIFF Bell Lightbox—part of Days of Glory, Masterworks of Italian Neorealism, a retrospective running from July 28th to August 28th. Click here to read my reviews of Il Posto (1961) and Bicycle Thieves (1948), also part of the retrospective.